I also love the chaos of my life and unexpected turns and adventures - but sometimes it can be a little much and normal would be a nice change. But I think I have to give up on that. It is one of the biggest issues with trying to meal plan and have it go off successfully. The other problem I used to have is grocery shopping - I tend to know the majority of the stuff that is in my home (my brain is just like that) but sometimes I just forget what I have ran out of. I have tried many different ways of keeping lists and they all usually end up sucking until recently. I was in the states and found white board paper that is tacky and sticks to any surface. I figured it would be good for Cadence to use so I picked some up. I ended up putting some up in the pantry and hung a container from the dollar store for white board markers - voila a huge grocery list for everyone to see and/or add to! It works relatively well - I just snap a picture as I am putting my shoes one and off we go. I am working on a inventory system for the food in the house and deep freeze to cut down on wasting food. (I have one up already for my spice cabinet which is fantastic). All this looks really good for getting organized right? Right!? except the farming meal planning is still an issue. So I usually do this as I'm shopping as I tend to get inspired (or see what's on sale.. same thing right?) and as I'm there I try to plan. 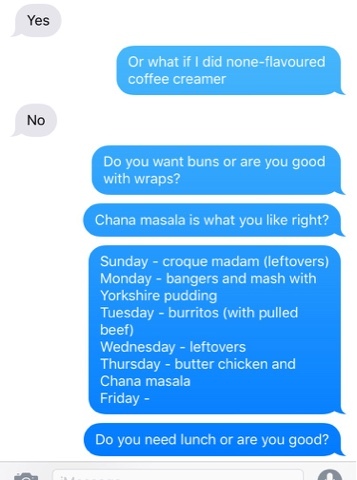 Here is my text to the husband from this weeks grocery trip - I had a plan! Croque madam, Bangers and mash (which turned into Toad in the Hole), Burritos with pulled beef, leftover, butter chicken and chana masala and the random day. Thursday - Grilled cheese and tomato soup. So two out of five isn't great. I think the plan for tonight is the butter chicken and chana masala (it was suppose to be Thursday but we had a frozen chicken issues...) To be honest though - this is an exceptional good week for "following the plan! I have to figure out a way to be able to plan but not plan if that makes sense - but alas this has always been my struggle with meal planning! I think it is a necessary evil as it prevents the I have NO idea what to cook syndrome that leads to eating out or being lazy so I will have to find a way to tough it out!